I never thought I’d see the day when a little Ferves Ranger would become a rap video car, but here we are. Honestly, I shouldn’t be surprised. The Ferves Ranger has star quality. 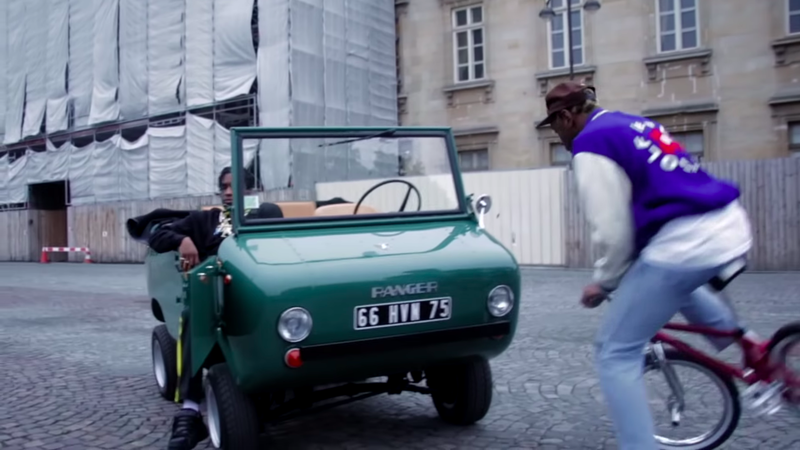 Tyler and A$ap Rocky put out Potato Salad today, a hang out session in Paris, feeling braggy, happy to chat about their latest that’s-not-a-purse-it’s-a-satchel. There’s a Based God shout-out, which reminds me to link to Night In Japan. But that’s neither here nor there. Stay focused. Ferves Ranger. The Ferves Ranger is a cousin of the Fiat 500 and 600. It uses a Fiat 500F’s engine (2 cylinder, 499cc, about 22 HP), a Fiat 600's suspension bits, and a custom body/tub designed for off-road use. The company, Ferves, gets its name from Ferrari Veicoli Speciali, and yes, that’s Ferrari Special Vehicles. I guess for Ferrari, this vehicle is pretty “special.” They only made about 600 Rangers, between 1966 and 1971. Early Rangers were 2WD, but they soon added 4WD capability, and, interestingly, a very low-geared differential to allow the car to “walk” slowly through woods or other rough terrain. It seems like a pretty useful and capable little off-roader. I do think it’s fair to keep on this thing as the “mostest cutest off-roader ever,” just because it is such a charming concentration of American style into European size, purposeful but compact. Now you know. Keep it in your mind.